Tom: Ok first, welcome Alan. I’m glad to have you join Jamey on Go Forth And Game. So remind us about Stonemaier Games. Alan: Hey, thanks for letting us talk a little about what we’re up to. For me, Stonemaier is a way for us to create games that we want to play. Playtest after playtest (and after we completed the playtests), I still really enjoy playing Viticulture. I think our main goal is to create games in that 2-6 player range, that scale well, don’t take an eternity to play, and are known for quality and depth. Tom: It was your first game and was a big Kickstarter success. It’s the mark of a good game that you still want to play and enjoy playing it after so many plays. We also engaged 942 people—the vast majority of whom were complete strangers to us before the Kickstarter campaign—and I wanted to continue to find ways to connect to that audience. I’ve done that in two key ways: One, talking about tabletop games on the Stonemaier Games Facebook page. I love to talk about games (both new and old) and game mechanics, as do a lot of other gamers. Two, so far I’ve focused the Stonemaier Games blog primarily on a series of “Kickstarter Lessons,” in which I relay some of the things I’ve learned to other potential Kickstarter creators. Having only run one successful Kickstarter campaign, I can’t pretend to be a Kickstarter expert, but I think I have a few good tidbits of information to offer. I’ve also spent quite a bit of time working on shipping logistics. 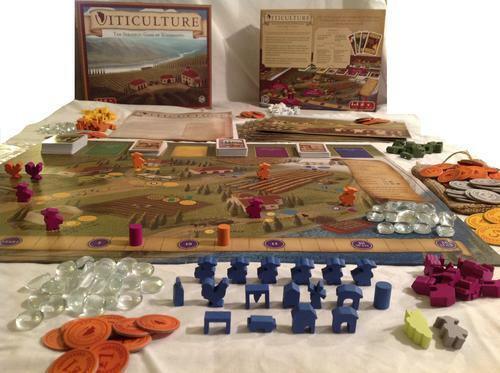 I want to get Viticulture to Kickstarter backers as soon as possible and help them avoid customs fees (legally). So I’ve connected to several fulfillment-by-Amazon centers around the world as well as companies called RIM and TCF (and Impressions to get the game in FLGSs) to establish that supply chain. 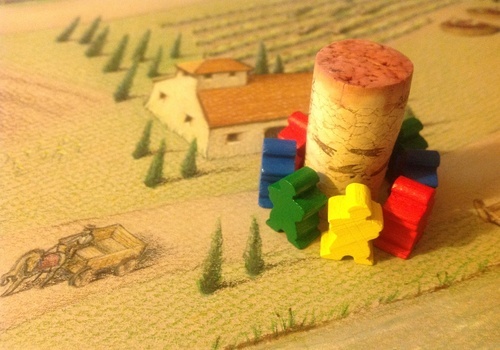 It’s an arduous but interesting process, and I’m hoping it will form the groundwork for future distribution of Viticulture and other Stonemaier Games. Tom: Give us an update on it. Alan: Our advanced copies just arrived a few days ago (March 15) and I can’t say how exciting it is to hold a copy of your first published game! It certainly didn’t hurt that our artists, graphic designer, and Panda Game Manufacturing did an incredible job with the components. The game looks and feels fantastic. Everything is customized and extremely high quality, and you can tell by the heft of it (4.6 pounds) that there’s a lot of game in the box. As for the schedule, it was really important to us that we deliver the game in May of 2013 as we promised to backers when we ran the Kickstarter campaign. Pending a huge crisis, we will not only meet that promise—we’ll exceed it for backers in Europe, Asia, Australia/New Zealand, and Brazil. US and Canadian games will take a bit longer because those games have to cross several oceans in big boats to get to us, but everyone should have their games by late May. Tom: You’ve done an excellent job keeping us up to date on the game. Thanks for that. Other KS folks should take note. That’s very exciting news. Were there any surprises with the campaign? Alan: We learned a lot in the first campaign. 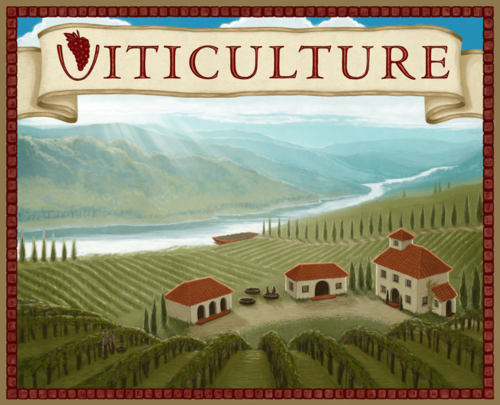 I think I was most surprised and am still pretty blown away by the loyal support we found, even now as we develop Euphoria, there’s a lot of confidence knowing that many of the folks who helped us with Viticulture are excited to see the next project. As a couple of guys having fun with a hobby, it’s pretty amazing that others are as excited about what we’re doing as we are. I was also pretty surprised to find that Jamey can stay up for 45 days straight with almost no hallucinations. Jamey: “Almost no hallucinations” is scarily accurate. Before the Viticulture Kickstarter campaign, I was the type of person who needed 8 hours of sleep to be functional, but I operated on 6 or less a night during the campaign, and I haven’t been able to get back up to 8 since then. Which is fine—more hours in the day. I was surprised that everything turned out as well as it did, honestly. Raising $25,000 (our original goal) is a lot of money—do you know how many Slurpees you could buy with $25,000? (Approximately 25,000 Slurpees).So to exceed that goal and have so many people be actively involved in the project was surprising and flattering—Alan and I were truly honored by the community that formed around Viticulture. I’m trying to think of something really specific that I haven’t talked about before, something that surprised me…okay, this is kind of random, but I was surprised by how well the backer toast went. At our $1 pledge level—an underrated reward level, if you ask me—the reward was that Alan and I would toast every single backer at that level (and anyone who added $1 to their pledge) on camera in one continuous shoot, one sip of wine per backer. Both of us were a little worried about doing it because of the amount of alcohol we might need to consume for the 110 backers we needed to thank, and I was worried it might be boring. After all, it’s just us going through a list of names and thanking people.As you can see, it does indeed start off pretty boring. But then something clicked (probably the wine), and all of a sudden it became this joyous and hilarious celebration of the backers. I’d do it again in a heartbeat. 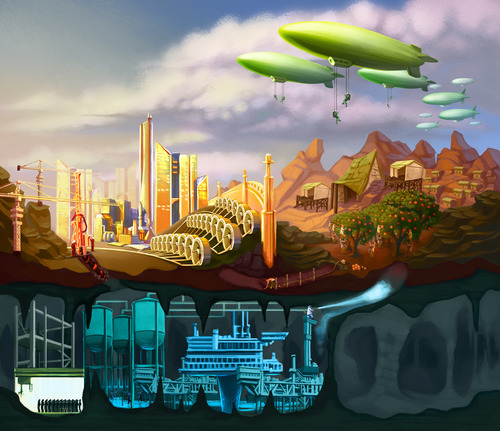 Our next game is about a dystopian cityscape—what do people drink in a dystopia? Mead? Tom: You had some pretty unique ideas about promoting the game and the campaign. I’ll not go into them here but rather point people to your interviews with Richard Bliss on Funding The Dream. Those are really good interviews. Speaking of Euphoria, tell us about it. As for the theme itself, I leave most of the details for the upcoming Kickstarter campaign (TBA), but the gist of it is this: Each player takes the role of a person in a dystopian future who is lucky enough to have a little bit of power. The world is still evolving, and it’s your time to claim a stake to the future. Thus you have a few workers who are there to do your will. Really, that idea was the origin of the game—I love worker placement games, but doesn’t it seem a little odd that the workers do whatever you want them to at any time? However, this makes sense in a dystopian world, because (as you see in dystopian fiction) they don’t have the freedom to choose anything different. 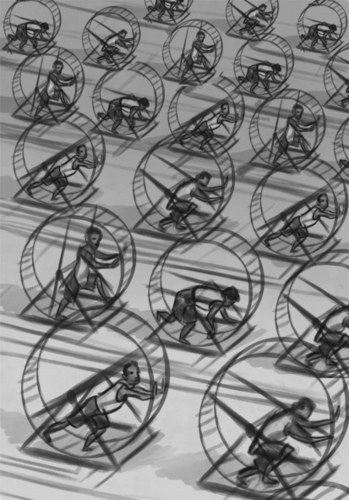 The key is that your workers don’t know they’re in a dystopia, so as their knowledge of the world increases, the greater the chance they’ll try to escape to something better. Tom: The name seems very 1984, which is one of my favorite books. Why a dystopian theme? Jamey: The driving force for me is that I really love dystopian fiction. I recently explored the reasons behind it on a blog entry on my personal blog. I like the elements of exploring the world, figuring out how it works and what happened to make it that way. I like the social commentary that connects to our modern world. And I like the drama of having one person up against the world—Ready Player One is a great example of this. 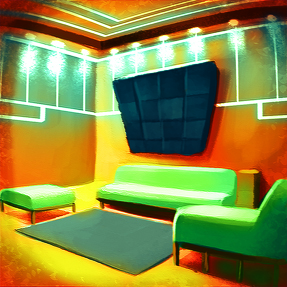 Alan: A dystopian theme gives us a lot of freedom to create a rich new artistically fresh world with the contrast of a whitewashed “perfect” society pitted against a shadowy underground that should make opening the game box an experience in and of itself. Then you get to play it! 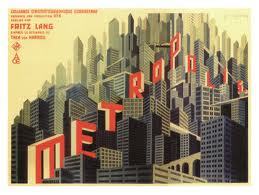 Tom: Oooo, kind of sounds like Metropolis. 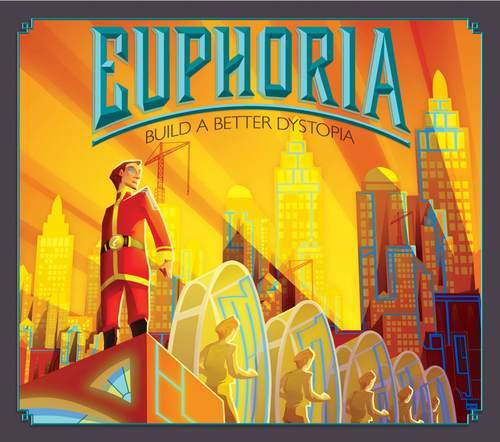 What is unique about Euphoria? Jamey: I’ve mentioned a few things above, like worker knowledge and the continuous flow of the game (there are several elements that contribute to the flow, but I won’t go into too much detail at this point since we’re still playtesting). In addition, the game uses dice in a way that adds variation and excitement without relying on luck (despite the dice, there is very little luck in the game). There is a thematic element that involves how you activate one of your “champions/recruits” that I really like. And perhaps my favorite element—also thematic—is that depending on how you prioritize your actions in the game, you can make the world more of a dystopia for the other players by restricting their “personal freedoms” in the game. It’s a highly thematic element with Euro-style repercussions to the gameplay. Tom: That element sounds really cool. Alan: I haven’t seen a game quite like it, it has elements of other games of course, but it is very much its own animal. Tom: I am so very interested in this game! Do you have a timeline? happen. Plus, I love the community engagement and involvement that happens on Kickstarter. Jamey: It’s going well. The next step is to use the actual game board art to playtest instead of the very rough mockups I was using. The game involves several actions that don’t make a lot of sense unless you have the art to guide you. I would be honored if you shared your insights through a playtest. Tom: I’ve seen the playtest documents and PNP and I’m really excited about this game. Before we leave Euphoria, we have to mention Jacqui Davis, your artist. She’s fantastic as you can see! Tell us about Jacqui if you will. Grant Rodiek recently wrote a great post on working with artists, and I particularly like the section about telling a story to the artist. This is much better than saying, “Draw a man with a green hat, a vial in his hand, and a smirk on his face.” Instead tell the artist the story of the man, where he comes from, and his role in the game. Let the artist take it from there. You’ll find (as we did with Jacqui) that her interpretation of the man helps the story evolve–and sometimes even the mechanics. A talented artist will do that for you. Tom: Anything else in the Stonemaier queue? Alan: There are several concepts in the queue, after we can settle down a bit on Euphoria, we’ll sit down and map out the next one. First in line is a prohibition era concept that it in its infancy. Tom: Dinosaurs. It’s the next big theme after steampunk. My prediction. So Tom, let me end by turning the tables on you: If you could interview one game designer of any game (tabletop or not, living or dead, fictional or nonfictional), who would it be? What’s the first question you would ask him or her? And which of their games would you most like to play against them? Tom: Look how clever you are. That’s an easy one. Stefan Feld or Sid Sackson. First question for each – “how the heck are you so prolific?”. Games to play against them is harder. For Stefan, probably what he’s working on at that time. For Sid, probably Focus. I enjoy abstract games and don’t get to play them very much. It’s cool having the tables turned on me. Thanks! Jamey:Thanks for the chat, and I look forward to more great things from Go Forth and Game! Tom: Thanks to you both for enlightening us about Viticulture’s progress and on Euphoria. I’m really excited about it. And thank readers for join us for this interview. If you have questions or comments, I encourage you to leave them below. Man, I really want to go watch Metropolis now. Under The Microscope – The Princess Bride: Prepare To Die! Thanks so much for the conversation, Tom! I love chatting about these sorts of things. If any other readers have questions in the comments, I’ll definitely reply.